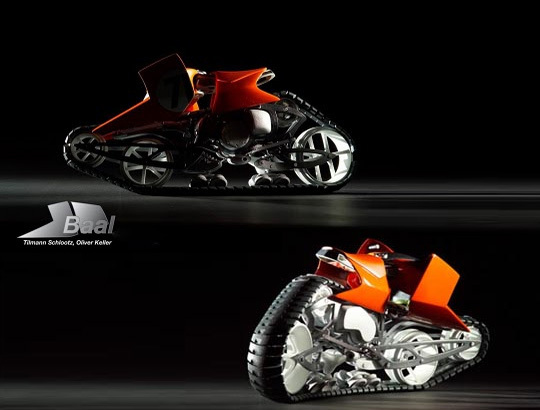 This is the Baal high performance design and its an awesome looking vehicle unlike anything I've seen before. Apparently the front and rear wheels both pivot (the rider uses both hands and feet to turn) and the track flexes to turn. Notice the two track placement rollers in the center look to ensure proper track arc alignment. The rollers pinch a center spine from the track and pivot opposite to the wheel to bend the track into an even arc during cornering. They also likely help distribute the weight of the vehicle for even ground pressure. The claim is that this track design has benefits in floating easily over soft surfaces such as sand, snow, and mud. I'm also amazed by the mono-shock suspension and geometry of the front and back pivot arms. 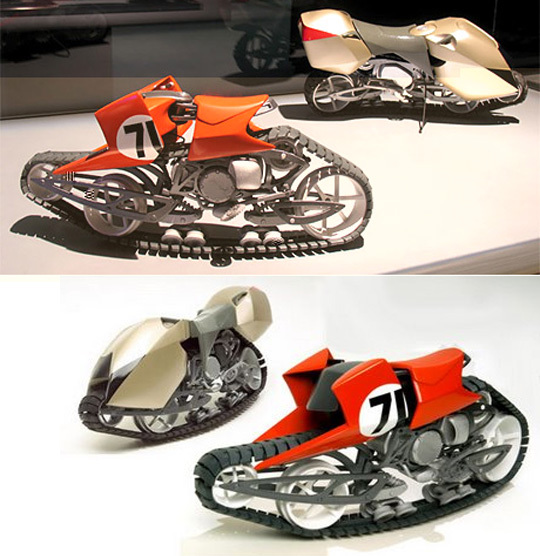 The frames look to be very similar to modern motocross motor bikes and likely accept similar sized engine and transmissions. Like most tracked vehicles, however, I'm thinking that the high speed handling characteristics are likely difficult at best. And, the added weight and drag of moving the track would decrease the efficiency of this ride. I'd guess the riding envelope would be on par with a large 4x4 ATV -- a strong performer in slow to medium speeds over difficult uneven terrain. I see this as being an excellent idea that I'd like to try out. Unfortunately, there are no plans at this time to put them into production.